MONTREAL - Montreal Canadiens general manager Marc Bergevin announced Monday that the team has agreed to terms on a three-year contract with forward Torrey Mitchell (2015/16 to 2017/18). 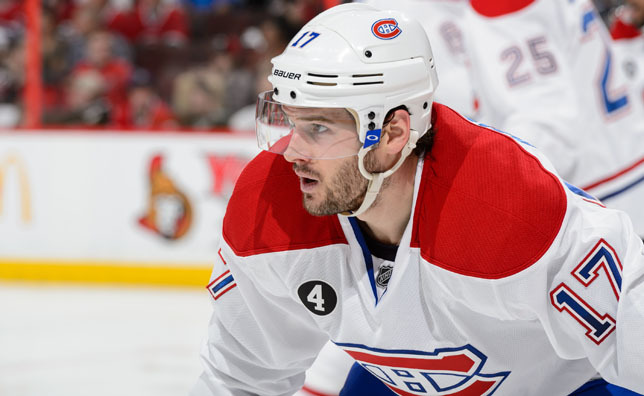 “We are very pleased to have come to terms on a multi-year agreement with Torrey Mitchell. Torrey is a versatile player who has a great deal of speed and experience. He was an excellent addition to our group of forwards last season, and offered a solid performance during the playoffs” said general manager Marc Bergevin. Mitchell, 30, recorded 14 points (6 goals and 8 assists) in 65 regular season games with the Buffalo Sabres and the Canadiens in 2014-15, averaging 14:11 minutes of ice time per game. He scored two game-winners and was assessed 34 penalty minutes. He also played in the Canadiens’ 12 playoff games, recording five points (1 goal, 4 assists). Since making his NHL debut back in 2007-08, Mitchell has recorded 105 points (42 goals and 63 helpers) in 457 NHL regular season games with the San Jose Sharks, Minnesota Wild, Buffalo Sabres and the Canadiens. The 5’11’’ and 189 lbs centre also played a total of 72 career playoff games, and registered 17 points (4 goals, 13 assists). A former University of Vermont Catamount (ECAC and Hockey East), Mitchell registered 105 points (35 tallies and 70 assists) in 115 games in the collegiate ranks. A native of Greenfield Park, Mitchell was San Jose’s fourth round selection, 126th overall, at the 2004 NHL Entry Draft. He was acquired by the Canadiens from the Buffalo Sabres on March 2, 2015 in return for Jack Nevins and a 7th round pick in the 2016 NHL Entry Draft.